Wild rice are four species of grasses and the grain that can be harvested from them. The grain was historically gathered and eaten in both North America and China. It is also called as Canada rice, Indian rice and water oats. 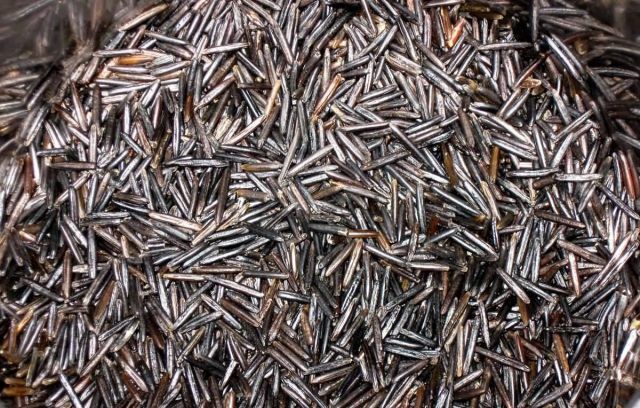 Wild rice grains have a chewy outer sheath with a tender inner grain that has a slightly vegetal taste. The plants grow in shallow water in small lakes and slow-flowing streams, often, only the flowering head of wild rice rises above the water. The grain is eaten by dabbling ducks and other aquatic wildlife as well as humans. Typically sold as a dried whole grain, wild rice is high in protein, the amino acid lysine and dietary fiber and low in fat. Nutritional analysis shows wild rice to be second only to oats in protein content per 100 calories. It is also a good source of certain minerals and B vitamins. Wild rice seeds can be infected by the highly toxic fungus ergot, which is dangerous if eaten. Because of its nutritional value and taste, wild rice increased in popularity in the late 20th century and commercial cultivation began in the US and Canada to supply the increased demand. Wild rice is also grown as an ornamental plant in garden ponds.